In a perfect village in Ohio, passions run deep. Strong feelings tie families and football teams together along the banks of a peaceful river. It was passion that brought Susan and Joseph together and gave them four sons, but passion is a cruel mistress and threatens to tear their lives apart. Amid the Friday night lights, everyday life, and family tensions, the residents of sleepy Monroe Falls live anything but quiet lives. 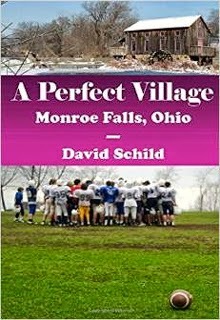 Everyone in Monroe Falls thought they lived in a perfect village. They loved their farms and stores. They went to mass on Sunday and prayed that their mighty St. Anthony Flyer football team would someday win the state championship.Then one day it all changed and nothing would be the same. Susan thought she had married the ideal husband. Joseph gave her four tall strong boys. She loved her coach husband until the beautiful Mary decided that Joseph was the right man for her. Then nothing would be the same for Susan. Andrew thought the perfect village was like all little towns in America. He could run, fish, and play football. Then one day all his imperfections made him realize that his love was an illusion. He and his brothers didn't want to leave the perfect village, but nothing would be the same. Charlie Resor thought he could survive in the perfect village until his past demons caught up to him. His life came down to his love for motorcycle racing and one last shot at glory. What will it take to return Monroe Falls to the way it was--or is that perfection really a dream?